The Avatar Mountains are a must see while in China, but you are going to be pretty lost if you don’t understand this simple thing. We have our go-to China Destination guide to help you out. 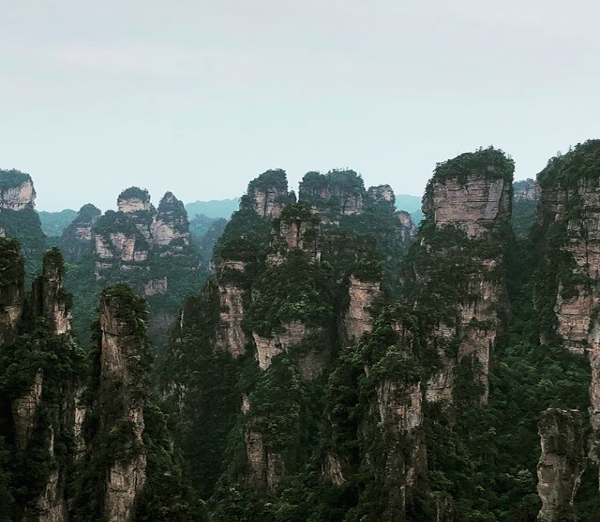 Our ILP volunteers living in China for a semester love visiting the Avatar Mountains in Zhangjiajie National Park — and for good reason! The views are breathtaking and something you shouldn’t miss out on. 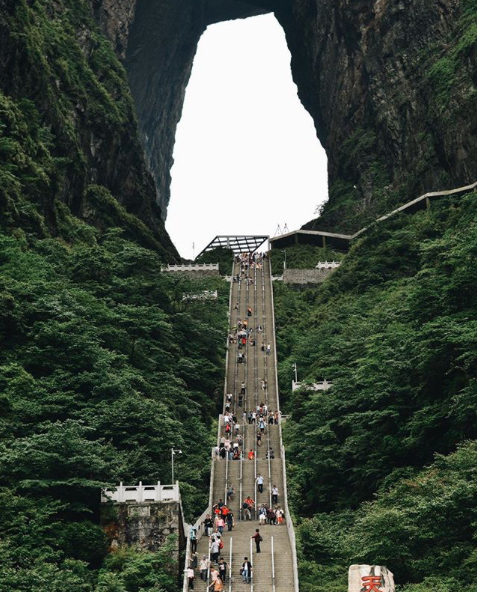 Volunteers also want to climb the 999 steps to see world famous Heaven’s Gate in Tianmen Mountain during the same trip. It makes sense, since both of these places are in the area ... but did you know they're not actually in the same city? But don’t worry! You can do both on your vacation once you know the layout. You'll want to pack both parks into one vacation because you can't miss either. The city of Zhangjiajie is where the train station and airport are. You will also find the entrance of Tianmen Mountain near Zhangjiajie City. The "first" Zhangjiajie we're talking about is a pretty small city in southern China, in the Hunan Province. This city is right at the base of Tianmen mountain. You can catch the cable car up to the mountain conveniently right in the center of town! If you catch a flight to Zhangjiajie, this is the area you're heading to. The airport is only a short taxi ride outside of the town. The "second" Zhangjiajie you'll hear referenced is Zhangjiajie National Forest Park. This is where you'll see the incredible mountains that are nicknamed the "Avatar Mountains" after the movie became so well known as being inspired by this area. Zhangjiajie National Park is also known as Wulingyuan Scenic Area. (Are you confused by all these names yet?) The town at the base of this park is in Wulingyuan District, so that's where that name came from. You might even hear it called Wulingyuan National Park ... but it's all referencing the same area. Though both called Zhangjiajie, the two parks are two separate portions of the area, and are about an hour apart from each other. The entire area is crazy beautiful, with towering cliffs and mountains blanketed in green. Both parks are home to some of China's most stunning sites and hiking trails, making it a popular vacation spot for those who know about it. 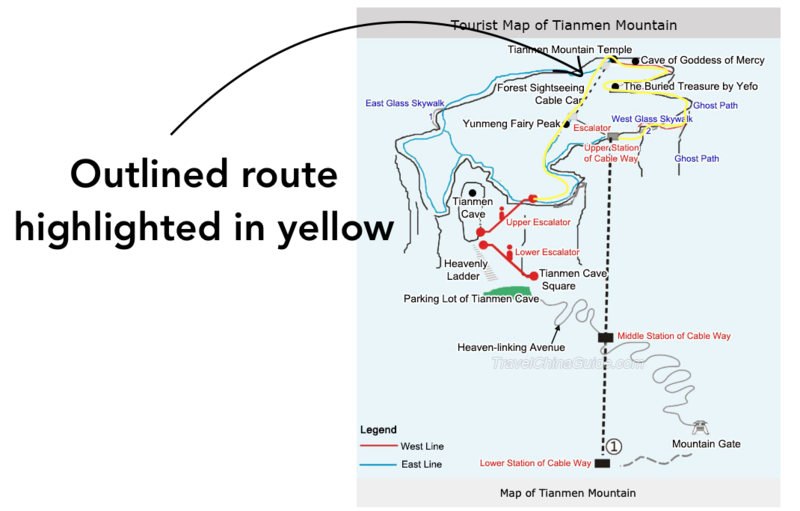 Here's a breakdown of Tianmen Mountain vs. the Avatar Mountains to help give you a quick idea of what both are like. Some of the separate mountains and rock formations that are really popular are the Tianzi and Hallelujah Avatar Mountains (those are the ones that inspired the Avatar movie). Talk to your hostel or hotel about outlining some of their favorite hikes to do while you are here and pack your camera! Seriously, you won’t be able to believe what you are seeing. 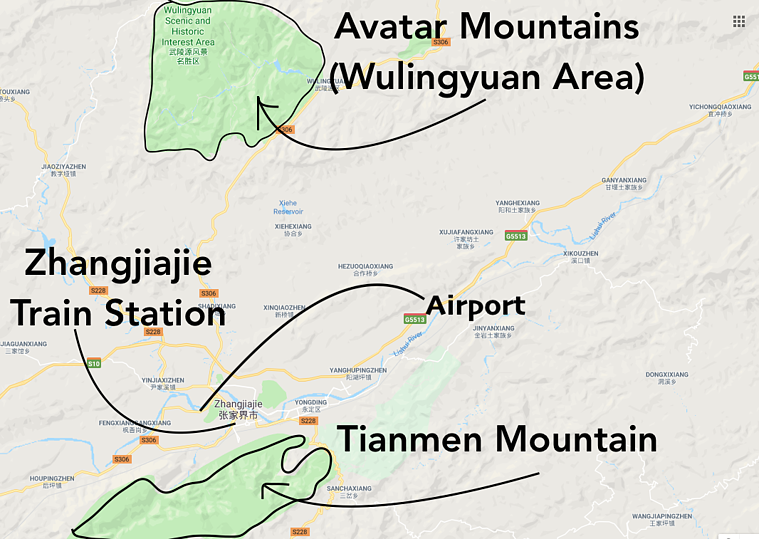 This blog post outlines more information about how to get around the Avatar Mountains and what to see inside of the park. It's outside of the park, but taking a boat tour of the dreamy Baofeng Lake is one of the things that most tourists overlook. It feels amazing to sit down and enjoy the sites after a couple of days of hiking. Here's more about Baofeng Lake. How Much Time Do I Need Here? You'll need more than one day to see Zhangjiajie Park. We suggest two full days in the park, minimum, though volunteers have happily spent three, which works well if you also want to visit Baofeng Lake. There are multiple routes and hikes that take most of the day, so there is plenty to see. You can't see it all in 2-3 days, but you can get a pretty good gist of it. We recommend picking a hostel in Wulingyuan town which will put you at the base of the mountain. There's not really anything to do here other than hike the mountain, so it's nice to be close to the entrance so that you can jump in line as soon as it opens in the morning. There are actually a couple of hostels within the park, but we've stayed at them at we don't recommend it. It sounds really cool to stay the night in the Avatar Mountains (and some serious photographers do this to catch the mountain views right at sun's up), but it's a huge hassle just trying to find your hostel in the first place. There's really not great directions and you're carrying your bags ... we liked the idea of avoiding the lines to enter the park but in the end we wished we had stayed in Wulingyuan. Here's what one volunteers said about the Wulingyuan Zhongtian Youth Hostel: "Victor was SO helpful; it was going to be rainy and cloudy our first full day in the park, so he mapped out a trail to explore along the Golden Whip Stream so we wouldn’t hike all the way up to the top of Tianzi to not see anything because of the clouds." This place is very inexpensive, has your basics, and is so close to the park entrance, you could walk (but we suggest taking the 1 Yuan bus). Love it. It’s about an hour or so drive to get to the nearest entrance of the park (Wulingyuan entrance) from the Zhangjiajie train station or the Zhangjiajie Hehua airport. Plan on paying about 100 Yuan to get from the train station to Wulingyuan City, which sits right near the park entrances. I’d vote to stay overnight near this section of the park rather than by the train station and airport. You don't want to have to take an hour cab ride every night just to get to your hostel, which is why we suggest booking right in the nearby city of Wulingyuan, or within the park itself. More on that below. Talk to your hostel about a tourist bus that can take you to the Wulingyuan Hostel (for 1 or 2 Yuan) or hop into a taxi ride. Once you arrive at the entrance, you'll be fingerprinted and you'll get your tickets. Students under the age of 24 get about half off your entrance ticket, so bring your ID and your ISIC card. However, some ticket agents will insist on only supplying the discount for Chinese students, but it's worth trying! You can buy a 5 yuan map at the entrance which is very, very helpful. You can find maps online but the map you buy tends to be the most accurate and helpful of the park. We say buy it. Good to know: Your ticket into the park is good for three days. It also lets you use the free shuttles inside the park which you will be so thankful for. The park is enormous and these shuttles help you get around. During national Chinese holidays lines to enter the park may get long. We recommend arriving as early as you can if you're visiting during one of these times. Also, be aware of where you are when it gets close to closing hours. The shuttles stop running when it's time to stop and they don't go out to see if anyone is still hiking around. Do not get caught missing the last shuttle! There are a few highlights (some caves, viewpoints, peaks) but the main attraction is the Heaven's Gate. Detailed on the map below (thanks, TravelChinaGuide!) you can see that this area is much smaller and easier to navigate than the Avatar Mountains. This blog post gives you an idea of what there is to see on Tianmen Mountain. Ride the cable car up, and make your way to West Glass Walkway (and try not to look down!) We made our way around the western edge to see the Buried Treasure of Yefo and the Cave Goddess of Mercy before taking the Forest Sightseeing Cable Car to Yumeng Fairy Peak. From there, we hiked to the upper escalator which is HUGE and takes you down through the mountain and drops you off just around from the back end of the Heaven's Gate. We then hiked down 999 steps and saw Heaven's Gate from the bottom. You're welcome to adapt that route, but after 2 days of hiking in Zhangjiajie, I didn't want to hike up all of those stairs! This is a one-day activity. My ILP group spent 2 days in the Avatar Mountains, then took a taxi over to Tianmen Mountain. You can't hike with your luggage, so you'll need to find a luggage hold (the ticket office pointed us towards a nearby hotel who would hold it for free). Then we spent the day on Tianmen Mountain before catching our flight back to our home city in China. 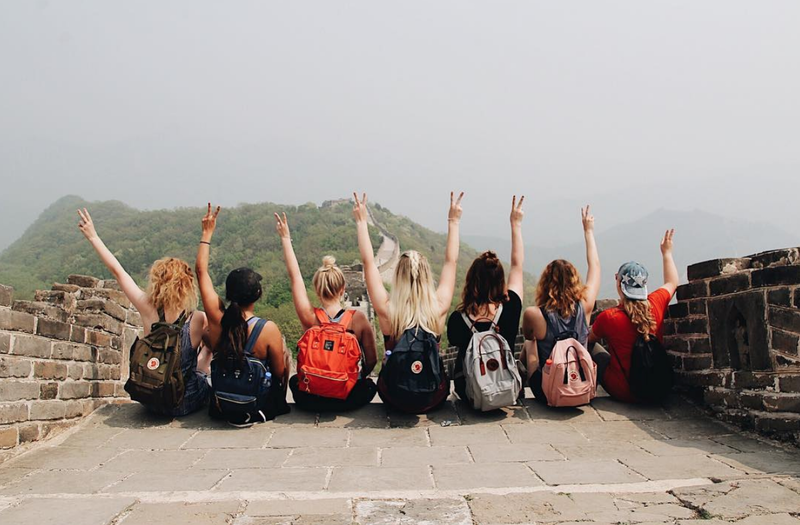 Here's what one ILP volunteer said about her stay at Qixi International Youth Hostel: "Such a great hostel! Super helpful! It's right close to a bus stop for the buses to Tianmen, and they had pretty good food too!" Another recommendation that's close to the mountain and has a free luggage hold that we're big fans of is the Zhangjiajie Base Youth Hostel. 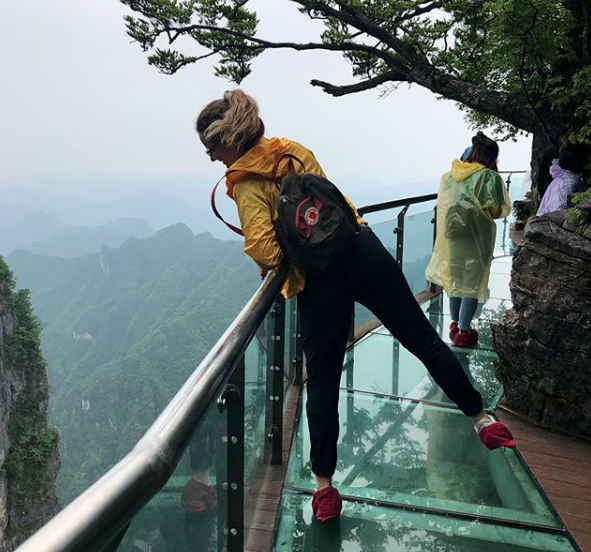 To see Heaven’s Gate and walk on the glass bridge at Tianmen Mountain, you need to go to Zhangjiajie city (near where the train station is), so budget time if you are coming from the Avatar Mountains. It should take about 40-60 minutes by car. If you are heading straight to Tianmen Mountain from the train station or airport, you'll be closer. It's a short cab ride from these two transportation hubs to get to the park entrance. Or you can take the bus: ride bus 1A, 1B, 10A, or 13 and get off at Tianmen Mountain Cable Car Company Station. To get to this mountain, you ride the world’s longest cable car! 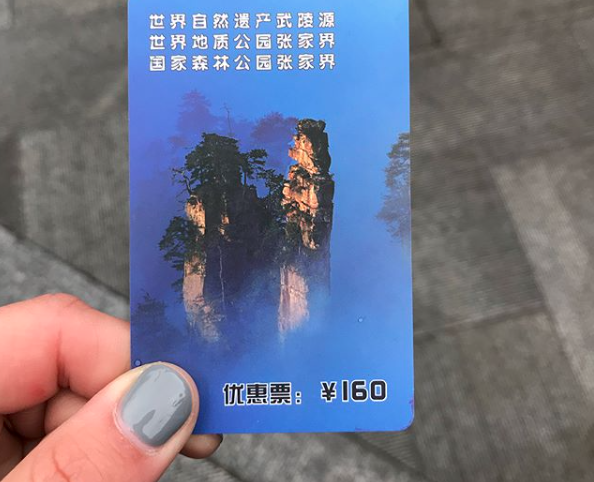 The cable car station (and also where you purchase your tickets for the mountain) is actually right in Zhangjiajie city, in City Garden downtown. It takes you from the city up to the mountain's summit. The ride takes about 30 minutes and there is usually a hefty line so budget that into your time. Plan on waiting anywhere from a few minutes to a couple of hours to ride the cable car. *Note: you can also purchase tickets to take a bus up to the summit, and ride the cable car down. We suggest riding the cable car up, and riding the bus down for the best views. When I went though, we were a little short on time and it just so happened that we would be able to get up on the mountain much quicker if we rode the bus up and the cable car down because a bus was leaving right away — we decided to do that instead of waiting a couple hours for our cable car and it still worked just fine. When you go to the ticket counter to purchase your tickets, they will ask if which transportation you want to take up and down. They can show you times for the next departure and that may help you decide what works best. Make sure you hold onto your ticket because you'll need to show it multiple times up on top. Cost: 258 Yuan. Tickets are 148 Yuan for tourists who are between 6 and 18. Your ticket includes the cost of one-way transportation, meaning you can ride the cable car up and take the shuttle van down the 99 turn highway. Good to know: Make sure to grab a map if you see one. There are different trails that lead you to the main attraction (Heaven's Gate) so if you want to go the route that includes the glass walkway, you'll need a map. There are additional attractions you'll need to pay for inside of the park at the summit, so bring extra cash. If you want to walk on the glass walkway, take a ski lift to another portion of the mountain instead of hiking, etc. all include a separate charge that isn't included in your ticket. Check the weather too; you wouldn’t want your spectacular views totally blocked by fog or mist the day you are riding up to Tianmen. If it's foggy, you won't be able to see a thing thing from the summit which could be a big bummer. Bring your passport — it's required to show it when purchasing your entrance ticket. Fly into Zhangjiajie Hehua International Airport (DYG). Look at flights on AirChina, Shenzhen Airlines, China Eastern Airlines, etc. You'll find quite a few cities that support domestic flights to DYG, but typically flights are more expensive than a train ride (though will take a fraction of the time). 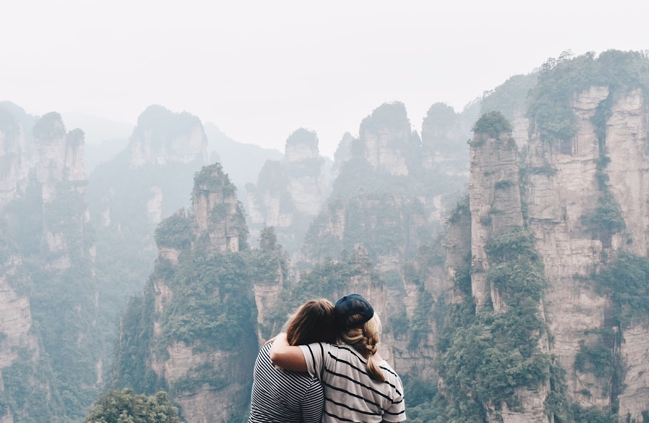 You might want to look into booking a train ride one way, and flying back to help balance the cost and help manage your transportation time for a trip to Zhangjiajie. Again, we love booking flights on Trip.com: their website is in English and makes it easy. Good to know: If your hostel will arrange an airport pickup for you, I'd go for that (although most don't). The reason is that as soon as you step outside of the airport, there's plenty of taxi men ready and waiting to charge you 4 times as much as the price should be. There is often a free shuttle available, so head there first! It will drop you off in town at the Civil Aviation Hotel, which is about 2 miles from the Tianmen Mountain Cable Car entrance. Once you're dropped off in town, it's fairly easy to hail a taxi. Taxi's within Zhangjiajie city are typically 5-15 yuan to get just about anywhere. As a much more budget friendly (though possibly time consuming) option, you can find multiple trains from all over China that will get you to Zhangjiajie. The train station you are looking for is Zhangjiajie Railway station, which is 24 miles away from the Wulingyuan Scenic Area, just to give you an idea. From Beijing, it's about a 24 hour train ride and from Changsha it's only about 4-5 hours. You can see how far away Zhangjiajie is by train by looking at Trip.com. You can also look at prices and book directly from that website. From the airport to your hostel or from the train station to your hostel, a taxi is going to be your best bet. 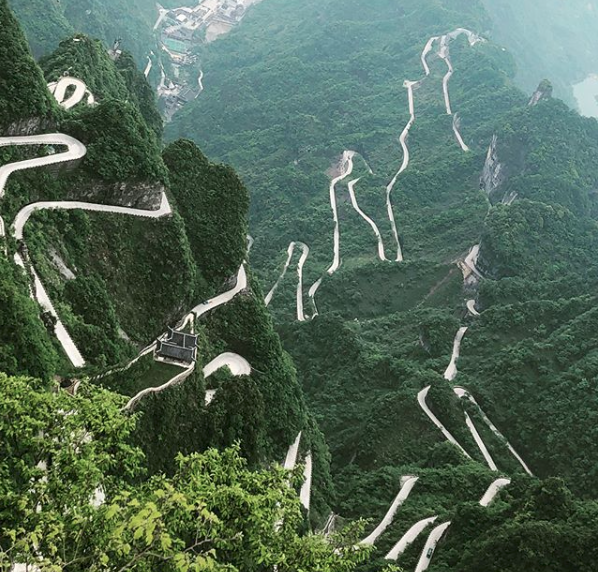 It's also our suggested method of getting from the Wulingyuan Scenic Area (The Avatar Mountains) down to Tianmen Mountain. Booking a hostel with a friendly staff will also come in handy because they can help you call a cab to get you to the park entrance, or to another portion of Zhangjiajie City. Just a couple of hours away is the city of Furong Town, which is a stunning ancient town that really couldn't be prettier. The site of a famous movie by the same name, Furong Town is full of waterfalls, picturesque ancient streets, and some of the prettiest shots you'll see in this part of the country. It'll take you about four hours to reach the ancient city of Fenghuang Town from Zhangjiajie, but it's well worth the bus ride. Beautiful streets, bridges and ancient buildings are suspended over an emerald green lake, creating one of the most well-preserved towns in all of China. 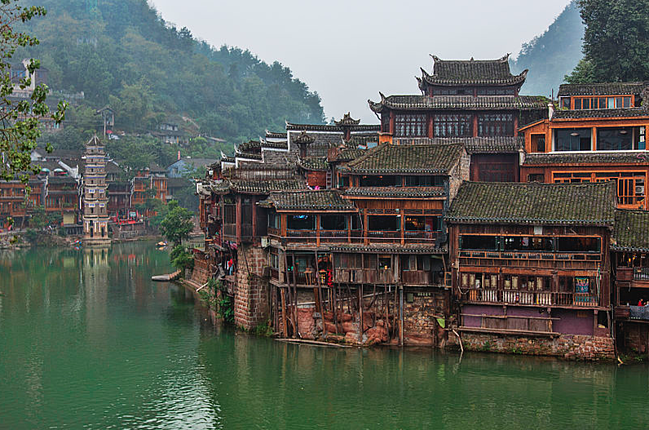 Get more info about Fenghuang here. Like the idea of teaching English in a foreign country?